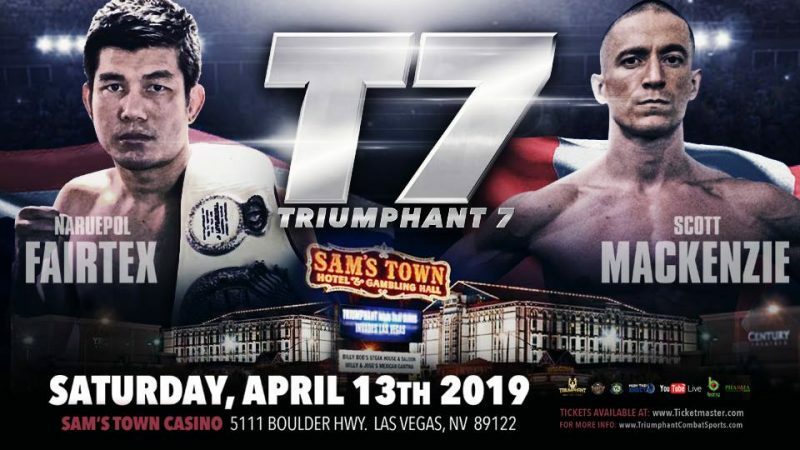 The main event of the upcoming Triumphant 7 on April the 13th in Las Vegas has now been released and what a belter it is. Scott Mackenzie will go head to head with Naruepol Fairtex in Las Vegas. Scott Mackenzie from Canada is an IFMA Pan American championship gold medalist and now trains with Kieran Keddle at the Elite Martial Arts Academy in Calgary. Kieran has been putting in a lot of work with Scott and he is currently on top of his game. Naruepol Fairtex was in the Contender series and is also a Lumphinee champion. He has a massive international following and now resides in the United States. He trains and teaches out of KOA Fitness in Newark, California where he heads the muaythai program. This fight is set to explode and both athletes are ready to go! From all at the WMC we wish of both of the athletes the best of luck! This entry was posted on Wednesday, April 3rd, 2019 at 10:47 AM	and is filed under News.